In Superfish, Rick Rosenthal searches far and wide for the opportunity to swim with the greatest gamefish in the sea — billfish. Today, some marine ecosystems may be in jeopardy of disappearing. Tell the world what you think is worth preserving. It may be unlikely that you’ve been lucky enough to come face-to-face with a “grander,” but we’re sure you have your own Super Sea Stories to share. Do you have special memories of time you’ve spent at the ocean — or in it? Have you had a close encounter with marine life? NATURE wants to know about it. Tell us your stories, and read those of other viewers, as we celebrate the world’s oceans and everything in them. Read submitted stories — or submit your own in the comments field below. “Underwater science is usually rather dull. Hours spent collecting data. Data that’s not particularly interesting in and of itself. Data that becomes interesting only when conjoined with similar data from other sites and times. 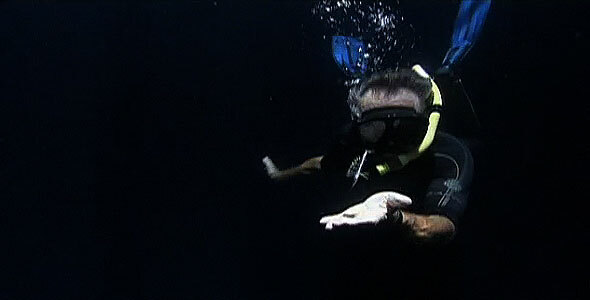 While the media stars of underwater science like Sylvia Earle and Bob Ballard reach out from the pages of a glossy book or beckon from a tightly edited video production, crisp and seductive images that intersect at a precise and meaningful conclusion right there on the last page or in the last minute. Real life is not like that, at least not very often. It’s repetitious … hour after hour, cold, uncomfortable, usually strenuous, occasionally dangerous. But every once in a while, every once in a long while, there’s magic in the water. The universe clicks just right and something really special happens that makes up for all that’s come before, something really special … really, really special. This was one of those times. It had been a hectic and eventful trip so far. I’d staged a close escape from one of those classic binds, having to be two places at once. I had to go out to sea on a research cruise, the ship was leaving the dock with the morning tide, but on the same day I was scheduled to deliver a paper at the annual American Academy of Underwater Sciences meeting. My Director, Jim Griffin, insisted that both things get done, he’s like that, used to be in charge of the Thor-Agena Booster Program for North American Rockwell and firmly believed in that NASA motto of, “the difficult we do immediately, the impossible takes only slightly longer” Our ship was leaving Woods Hole and transiting the Cape Cod Canal on its way to the Gulf of Maine. If my talk was moved to the first slot in the morning and there were no hitches, I could be back in time to meet the ship at the north end of the canal just after sundown. I were late … Plan B goes into effect, a night-time, “casualty evacuation drill” with a USCG helo a good friend flew out of Otis. That’d be the cover for my Plan-B ride out. On Friday I stowed the last of my gear on the ship and I caught an oh-dark-thirty flight out of Boston down to Florida. A quick cab ride and I was at the podium going over the slides that illustrated a paper I’d coauthored with Rich Pyle of the University of Hawaii on the use of mixed gas, open circuit scuba down to five hundred feet. Twenty minutes of talk, ten minutes of questions, I shook the moderator’s hand as I shoved my Certificate of Appreciation into my case and scooted out the back to a waiting cab that took me back to the airport. I ran for a plane back to Boston and on the plane I switched my tan Sunday-go-to-meeting suit for a pair of 501s, a black U. C. Berkeley sweatshirt and my topsiders. My work study student, Dave Sipperly, was waiting for me curbside at Logan. I threw my leather flight bag and black Halliburton, the one covered with dive stickers, on the back seat, jumped in front and off we sped; south toward the Cape. Down Highway 3 to 6a, over the bridge at Sagamore and left onto Tupper Road, left again to Town Neck Road and one more left onto Coast Guard Road. There, at the north end of the canal was a small U.S. Coast Guard station. We pulled in past the whitewashed rocks. I got out, retrieving my Zero-Halliburton from the rear seat., pulled a set of CANDIVE coveralls from the top of my flight bag, which Dave would drop at my office. We’d made good time, the ship was not due for a good half hour and Plan-B could go by the board. I pulled my ICOM M5 out, slid a charged battery pack on the bottom and keyed it to 16. “Whiskey, Victor, Foxtrot, Quebec.” I repeated the call ship’s call sign three times and then identified myself, “This is WVFQ Port one, come in.” No response yet. I had some time to kill and the heavy humid air was cooling now as the sun dipped below the land west of the canal. I shivered slightly and went into the Coast Guard station. I found the O.D. and explained that I was meeting a boat out of the Hole, and that it would heave-to outside the north end of the canal and send a Zodiac for me. The Coasties seemed happy to have something to break their routine; they offered up a mug of hot coffee and asked if I wanted to use their longer range base station to call the ship. The O.D. offered to save us time and confusion by running me out in their rescue boat. I could see the ship in the canal. I pulled on the bright orange coveralls that Jim English, CANDIVE’s Operations Supervisor gave me when we’d worked with the Deep Rover submersible at the Caribbean Marine Research Center during Sylvia Earle’s record dive the year before (but that’s a story for another time). We went down to the dock, hopped into an overpowered hard bottom inflatable and sped out toward the oncoming ship, blue lights flashing and sirens screaming. We screamed past the ship, starboard to starboard, headed in opposite directions, came about in a tight turn to port and then pulled up along side the moving and much larger vessel. At about eight knots our boat slid smoothly over to the Jacob’s ladder hanging amidships on the starboard rail. When the Coastguardsman shouted, “Go!” I leaped from the port gunwale of the RIB, out across the black chasm and grabbed on to the Jacob’s ladder. The small craft veered off to starboard, throttled back and then came back up along side of me. I gripped a treadle with my left hand and leaned out. A Coastguardsmen handed my case up to me. I passed the case up over the rail to a fellow Explorers Club member who was making the cruse with us and clambered aboard. Not exactly the way I usually start a cruise, I was really having fun with “action movie” aspects of the situation. Supper was still on in the mess. I had a meal and then we all got to work. The compressor van had to be hooked to ship’s power and run. The air had to analyzed and the bank brought up to pressure. Filling whips needed to set up at the waist and a 10,000 PSI Kevlar line run from the compressor up on the O1 deck down to the filling station. All our gear for the next day’s dive needed to be unpacked and readied. Contact with Offshore Medical Services had to made and communications with our contingency helicopter evacuation facility needed to be tested. With everything done, I rolled into my rack about 22:00 hrs and was out like a light. Eight bells. I got up, showered, pulled on my coveralls and went up to get some chow. No one else from the science party was up yet. I had a chance to spend some time with the ship’s folks. I went over the general dive procedures with the Captain, who had stayed up beyond his usual midwatch so that we could talk. The Coxswain set up the diving Zodiac and we went over the boat and all of its gear. By now it was seven bells in the morning watch and the science party was drifting into the mess, pouring coffee and sitting down in the library and the lab. Dive procedure’s pretty straight forward. The Zodiac is on the deck. You assemble your rig and put it in the boat. You put your weight belt in the boat. Then you go and get your suit on. By the time you’re dressed in, the ship’s crane has put the loaded Zodiac and the Coxswain in the water and the crew had rigged a Jacob’s ladder over the rail. The water is about nine feet down that ladder. The Zodiac is held against the side of the ship with a bow painter and a stern line and you clamber down the ladder into the boat. You put your gear on in the boat while it motors to the site. On the way the you run through pre-dive checks and once there, back roll off the inflatable’s gunwale into the water. We needed to service some instruments. The bottom’s about 110 feet. It was a great day, visibility was more than 100 feet. There were immense numbers of herring in the area for their late summer spawning. Down we went through the loosely organized school to the tide gauges. It took about ten minutes to dump the data and reset the gauges; the herring cast enough shadow that we needed our dive lights to see what we were doing. Our tasks done we were getting ready to leave, suddenly … in the blink of an eye … there was a snap from an eerie deep green to pitch black. The lights were out! Mounds of herring pressed closely in on us. I was completely blind. No gauges, no buddy, not even my light was visible. I raised my light and pointed it straight toward my mask. The beam burst into a million mirrored reflections off the herrings’ scales. I took a slow deep breath and felt myself lift off the bottom and begin to ascend. Carefully I maintained slight positive buoyancy with my lungs. I could not see my gauges. I could not judge my upward progress. My field of vision was filled with the scintillations of my light reflecting off the herring that had closed tightly in upon me. As fast as the dark had arrived it was gone. My eyes were momentarily dazzled. I exhaled sharply and sank back into the darkness below. Another breath started me up slowly. This time, just as my head broke out of the tightly packed herring school, I exhaled gently and transformed my ascent to a hover. From my chin down and out as far out as I could see, there was a black mass of squirming fish so closely packed that there was little room even for water. I turned to my left through about three-quarters of a rotation. I could see one of my three comrades coming up out of the herring mass, perhaps twenty feet away. She ascended about ten feet and pitched back to horizontal, leveling out and smoothly neutralizing her buoyancy. A circular motion of her light indicated she was fine, had seen me and inquired as to my status with that unique economy of the underwater “okay.” I brought my seemingly detached left hand up out of the darkness and responded in kind. Suddenly, she pointed sharply to her left, her arm stiff and outstretched. I swiveled my head right, and there is one of the most incredible sights I’ve ever witnessed. Six Giant Bluefin Tuna move toward us, in formation, they pass between us. Each fish, the size of a dinner table that would seat eight, moving fast, yet without apparent effort. They glide past, each with a huge left eye that stutters for a tiny moment as it find me for a fraction of a second and then moves on to seek it’s normal prey. We watch them almost disappear, circle to the right, and move to the other side of the herring school. They come right back by us and go left to the other side of the seamount. The black shinny mass beneath us starts to break up, the herring resuming more normal individual distances and expanding their school upward and outward. Once again enveloping me in darkness that slowly lightens to the deep green we saw at the start of our dive. I swam up to my teammate and joined her in a hover. We moved to the down line and ascended to our deep stop. Being out of the lee of the seamount now, the current is rather stiff, we tied off with our Jon lines, waited a minute and then ascended to our 20 foot stop.